Grandpa Pseudoraptor was born in a dream, as so many things are. The young girl who dreamed of him created him out of the images in a book that she found in a dusty box of old stuff that her parents kept in the cellar: a book that told of the ferocious lizards of the ancient days, of the long ages that their kingdom lasted and of the sudden destruction which engulfed it. The images and stories in that book came to life in her imagination. She could barely read, but it didn’t matter; what she didn’t understand she made up for with her knowledge of the island on which she lived. She could never remember the name adults called it, but in her mind it was called Lizard Island, because there were lizards everywhere. Lizards of all colours, on the trees, in the bushes, on the houses. There were also crabs, and sometimes she thought a better name for the island would be Crab and Lizard Island, but that was probably too long, and anyway the lizards were much better. It was because she knew the lizards so well that the book impressed her so much. The jungle in the illustrations wasn’t so different from the jungle near the village, and the ancient lizards were like bigger versions of the lizards she saw every day. That’s why the lizard she dreamt of was orange; she’d seen a little orange one the day before. She couldn’t know that the raptors of our world never looked like that – or that in fact they were a whole lot more like chickens than anything else. And so Grandpa Pseudoraptor took shape. She always thought the name was a little strange, but it was his own idea, so why argue? Oh, he was a silly old dinosaur. He was very old, because he had survived when the big rock fell out of the sky and killed all the others; yes, he’d run off to hide in the forest, like her parents, and so he’d survived all the bad things that happened. He was a bit crazy, always wanting to play or to tell jokes, but he was a clever one, and he was friends with all the creatures of the forest. Even with the snakes! When bad people would come to the forest, the snakes would watch them and slither to Grandpa Pseudoraptor and tell him how to avoid them. And the bad people never found him, and the Boss yelled at them for failing. It was very funny. Grandpa Pseudoraptor lived in the forest for millions of years. His beard grew very big. Sometimes he left the forest to go travelling in secret, disguised as a priest. He learned all the stories of the island, all the secret stories that the Boss didn’t want anyone to know about, and he grew very wise. Wise people usually had big grey beards, unless they were women. Why couldn’t women grow beards? That was kind of unfair. One day the bad people who worked for the Boss came to the house where the little girl lived with her grandfather. They started shouting and asking silly questions about her parents. Her grandfather was very old and a bit foolish, because he didn’t have a beard, so he didn’t know how to tell the bad men to go away. Then the bad men started hitting him and the little girl had to run to protect him, and they started hitting her too. It was awful and she cried very much, but she also got very angry. She got so angry that Grandpa Pseudoraptor heard her screaming in his jungle and came running to help her. “Stop this immediately, you silly humans!” he said to the bad men. 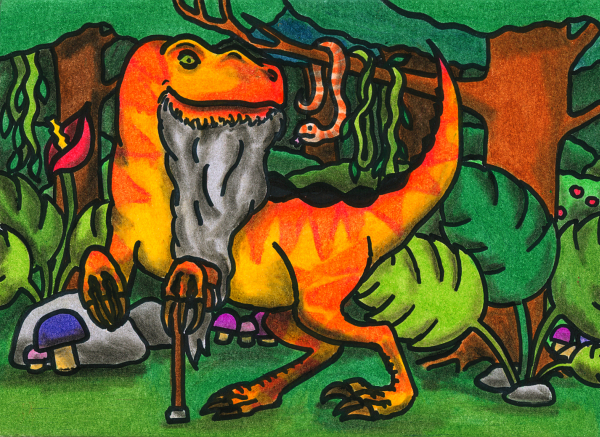 “I didn’t come here all the way from my jungle to sacrifice myself!” Grandpa Raptor said. Then he tore the bad men apart with his claws and his teeth until they were like minced meat, and then he ate them with some black beans and rice. It wasn’t very pretty, but have you seen a lizard eat a bug? The little girl left with Grandpa Pseudoraptor to go live in the jungle, where the bad men couldn’t find her. She would stay there until a time came when she could fight the bad men on her own. He taught her all the survival tricks that he knew, all the ancient secrets from the time before the big rock fell, and she became wise like him. She never got to have a beard, but as she grew older she realized that being a woman had other advantages which balanced that out. Is that the end of the story? Of course it isn’t. The Boss is gone now, but his friends are still in power, and not much has really changed. And she’s still out there, in the jungle, preparing. Her time is close now. One day soon she’ll realize that the jungle is full of others just like her, full of lost children and their strange protectors, and something will rise out of that jungle that not the mightiest army can withstand. Grandpa Pseudoraptor knows this day is coming. He can smell it. That’s why he’s smiling. This entry in the Oneiropolis Compendium was made possible by Eugeniy Rozhkov.